Now offering a SUMMER SPECIAL if you choose to book any 6 nights the 7th night is FREE. All bookings in winter for 6 nights will include the 7th night free and also includes 1/2 PRICE MUTI -DAY SKI/SNOWBOARD RENTALS from MTN. MIKES SPORTS in Squaw Valley for all our guests on all bookings for 3 nights or more AND 15% OFF MSRP ON ANY RETAIL PURCHASES. Please refer to the rate page for more details. Welcome to Squaw Valley! 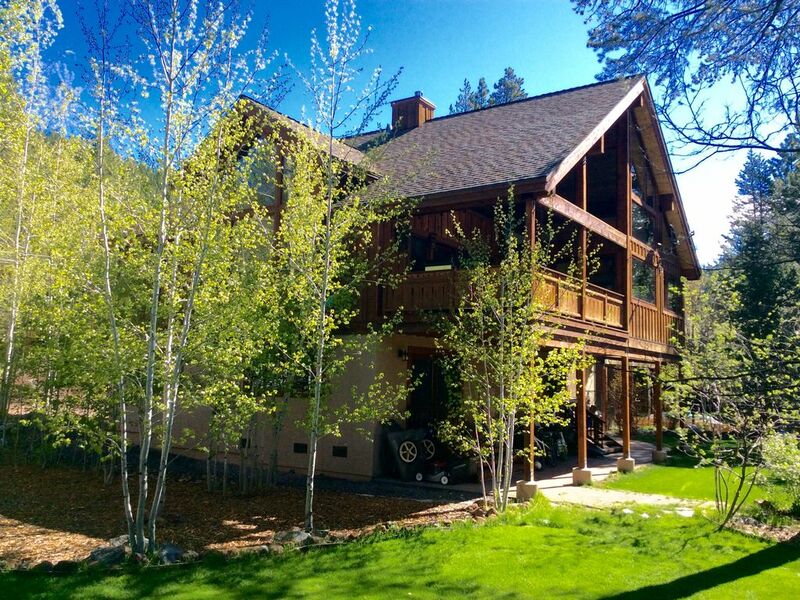 Our luxury 5 bedroom/4 bath home is located 1 mile from the ski resort. It combines modern luxury with mountain comfort. This home accommodates up to 12 PERSONS, addition charge for more than 12 will apply at $50 per night per person. Enjoy the large luxurious living room with it's grand gas stone and copper fireplace. Comfortable leather couches invite you to snuggle up, or watch Satellite Direct TV on the 55' flat screen. The gourmet kitchen boasts granite counter tops and knotty alder cabinets, and every luxury to make your stay comfy. We include everything you need for your memorable mountain vacation. TOP FLOOR: KITCHEN, DINING and LIVING rooms are an open floor plan. 1) The MASTER KT-22 SUITE features a 4-poster king bed and private bathroom. BOTTOM FLOOR: There are 4 BEDROOMS/ 3 BATHS downstairs. 2) HEADWALL BEDROOM SUITE has king bed and a queen sofa bed with its own private luxury bathroom and 50 inch flat screen HDTV. 3) GRANITE CHIEF BEDROOM has 2 luxury queen beds with shared bathroom. 4) PAPOOSE BEDROOM has a twin over full hickory log bunk bed with an additional twin bed. 5) SQUAW BEDROOM has a queen and twin bed with private bathroom and flat screen TV with it's own private entrance.This room is separate from the main house but has direct house entry. GARAGE: The 2 car garage is attached with direct entry into the house and the Squaw Bedroom. Additional outside parking for 2 more cars is also available. CARETAKERS APARTMENT : Please note that we have an on site caretakers apartment above the garage with its own separate entrance and staircase. She is very private and quite. Please refer any questions or concerns to us first. LOCATED LESS THAN A MILE from the Ski Resort and the Village with FREE SHUTTLE BUS pick up and drop off. Situated only one block off the main road on a level street, (safe-easy winter driving) with a direct garage entrance into the house, our guests can enjoy peace and quiet with simple access to endless winter skiing activities, shops and restaurants in Squaw Valley. As our guests we offer you 1/2 PRICE MUTI-DAY SKI/SNOWBOARD RENTALS from MTN. MIKES SPORTS of Squaw Valley. ( NOT VAID ON SINGLE DAY RENTAL ) plus 15% OFF ON MSRP ON ANY RETAIL PURCHASES !!! About Michael & Debbie Pavel. Located only one mile from Squaw Valley Ski Resort we offer you luxury and convenience for a truly memorable ski vacation. We offer all our guests 1/2 PRICE MUTI-DAY SKI and SNOWBOARD RENTALS from MTN.MIKES SPORTS in Squaw Valley. AND 15% OFF MSRP ON ANY RETAIL PURCHASES. View more about Michael & Debbie Pavel. Located 1 mile from ski area with a view of Squaw Peak. Gourmet gas stove, Microwave,Toaster Oven,Bagel Toaster and Coffee Maker. Covered Deck, no snow shoveling required. 1/2 Price Ski/Snowboard Rentals at Mtn. Mikes Sports included with house rental. Mike is an incredible host, the house is immaculate and has its own original style that you would want and expect with a cabin in the woods . The room layouts are great, with the master being the centerpiece with its incredible bathroom and separate sitting space. The kitchen had every amenity you can ask for, and we had a cook with our party that couldn't have been happier. We had three families with four children under the age of 10 and the bunk bed room was perfect. Half price rentals was a great bonus as well as the visit from Mike to make sure that everything was going smoothly. So close to squaw and with the free shuttle run by the city, we would get to the ski lifts, dinner, the market with ease, even during a blizzard! We could not recommend this house more for your vacation needs. Great home, close to Squaw and Mike and Debbie are fabulous owners. We loved our Thanksgiving stay. The home was clean and well appointed. Our hosts were ultra responsive. Couldn’t ask for more. Can’t wait to come again! We loved our stay at Powder Moon. The house was wonderfully large and comfortable. Perfect for a large family - Nice rooms and the backyard was an unexpectedly well manicured and has a cricket game which my son enjoyed. Everthing you might need in the kitchen was provided, like home. Just 5 minutes from Tahoe City. Very convenient. The 5th bedroom located thru the garage was not as comfortable as the rooms in the main house but my son and his friend thought it was great - had their own place. Beautiful Tahoe retreat, as advertised, friendly/amenable owner/manager. Powder Moon is spacious & comfortable, with a great location convenient to both valley and lake. 10 family members were very comfortable. All the amenities are "as-advertised," and the owner is friendly and attentive. Go for it! Additional 10% resort tax and a $300 cleaning fee.